eSign is one of the key element for Paperless revolution, as part of Government's Digital India Program. Keeping in line with the Digital India Initiative by the Government of India, eMudhra has developed eSignature services - a new and innovative electronic signature service (eSign) which can facilitate an Aadhaar holder to digitally sign a document within seconds from anywhere and anytime. eMudhra by virtue of being a Certifying Authority under the ministry of IT, Government of India, can issue legally valid eSignatures. Under the Information Technology Act, eMudhra's eSign is legally valid and substitutes the need for a physical or wet signature. 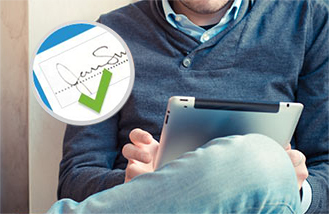 Hence, wherever a Customer is required to sign any documents, eMudhra's eSign can be used. Banks, Financial Institutions and various other agencies are now using the eSign services for routine service requests such as Deposits, Nominations, Salary Accounts and other service requests thereby saving cost and resulting in improved Customer experience. From a business perspective, eSign would change how business is done in India. eMudhra eSign's idea is to aid in the digital transformation of the whole country and improve ease of doing business. eSign will significantly accelerate the ease of Customer, employee or vendor onboarding by any organization and doing online transactions anytime from anywhere with any of your constituents. Thus it will result in huge cost reduction and achieve faster turnaround time for all transactions that leads to a cashless society. eMudhra is already working with several Banks, Payment Banks, Financial Institutions, Brokerage Houses to enable paperless transformation and aims to reach 10 million eSigns within the next few months.